Two weeks ago, Quebec’s Finance Minister was very proud to announce that Quebec had eradicated its deficit. Obviously, he refrained from going over the list of all the cuts, decreased services, and job losses that were required to reach this fiscal Holy Grail. The absurdity of putting away, year after year, large sums of money into a Generations Fund while public finances were in the red also remained unmentioned. 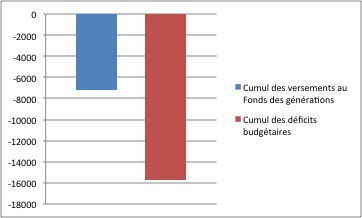 The Fund was created in 2006 to decrease Quebec’s debt. The Caisse de dép?t et placement is tasked with managing an investment portfolio, which —fingers crossed!— will yield good returns. On paper, it is meant to reassure the financial markets and rating agencies, so that they know that in Quebec, the government is taking the “issue” of public debt seriously. Problem is, ever since the Fund was created, a majority of the sums paid into it came from budgetary deficits. Looking back to the very first payment, close to $9 billion was redirected from providing services to citizens to the Generations Fund. During the same period, the government registered a $16-billion negative fiscal balance. Therefore, 57% of the last years’ deficits could have been avoided had we simply stopped putting money into the Fund or disbursed the sums gathering dust there. Next time you go to the hospital and find the waiting lists to be longer than ever or when you’ll have the unpleasant surprise of realizing that the resources meant to assist your child who suffers from an attention deficit problem no longer exist, just remind yourself that future generations are thanking you for your sacrifice. Is this strategy worth it? A quick analysis —which, I know, should be further developed— indicates that it is not. In 2014-2015, the Generations Fund had $7.3 billion in assets. The Caisse used this sum to earn $302 million in investment income, a 4.1% yield. Since it is a sound assumption to consider that 100% of the money allocated to the Fund came from deficits, we need to ask how much it cost the government to borrow the money needed to set up this Fund. Last year, the average interest rate for state borrowing reached 3.9%. That means that in 2014-2015, the interests paid by the state on the debts which allowed it to set up the Fund cost us $284 million. We are therefore left with a humble profit of $18 million. It seems rather obvious that future generations —in whose name the Fund was created— would benefit much more from strong public services. This article was written by Philippe Hurteau, a researcher with?IRIS—a Montreal-based progressive think tank.
? Equalization: is Québec committing a hold-up? I do not agree with the argument. This is the type of argument that screwed up the Alberta Heritage Fund. To begin with, the money invested in the fund is yielding more then it is costing us to borrow (even if only a tiny amount). Most importantly though, why give the government an excuse to dip into the fund? There is plenty of fat to be cut and we should force the government to deal with the deficit by cutting costs. For instance, unlike any other province, QC has redundant government bureaucracies like Revenu Quebec?